It should surprise no one that I'm a goal-driven person. I don't always achieve my goals, but I really enjoy the process of setting a goal, working towards achieving it, and the self-reflection that follows regardless of whether I achieve or don't achieve the goal. 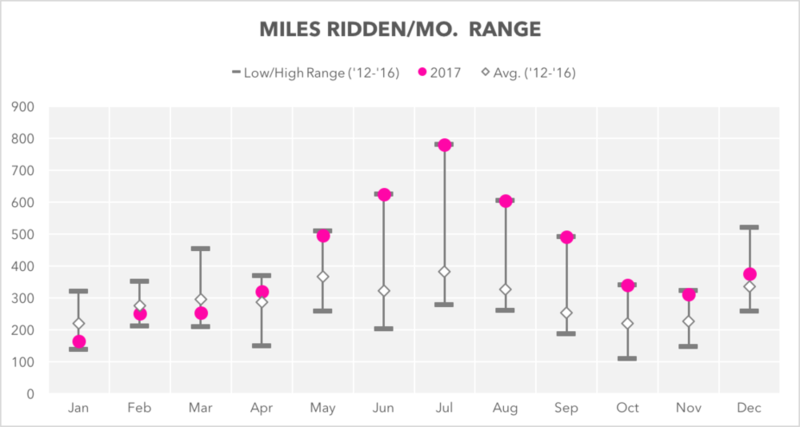 This past year (2017), I was looking for a new goal besides an annual mileage target (ride 4,000 miles/year). Mid-summer, I decided I would try to ride for thirty consecutive days. I ended my streak at sixty days. Looking back, riding sixty days in a row wasn't as hard as I thought. It ended up being more mental than physical, which seems typical of "physical challenges" I've undertaken. With that goal out of the way and a health dose of miles during the same period, I started thinking that I might be able to hit a new milestone for annual miles biked - 5,000 miles. However, what seemed like an attainable goal even through the fall, nearly fell apart in November and December as my body started to tap out from a year's worth of stress. The physical and mental fatigue hit me hard around Thanksgiving and it was a real fight with myself to try and get to the finish line. I even wrote about my struggles here. In the end, I logged 5,013 miles for the year. The last ride of 27.4 miles on New Year's Eve was a tough one but I pushed through and I'm glad I did. To cross the 5,000 mile mark is a nice achievement for me. I don't think I'll shoot for it in 2018, as I think achieving this goal came at a cost and I want to explore other activities like cross country skiing (which I didn't do last year) and snowshoeing (especially since I broke down and bought my own pair!) to keep me mentally and physically "fresher" through the winter months. 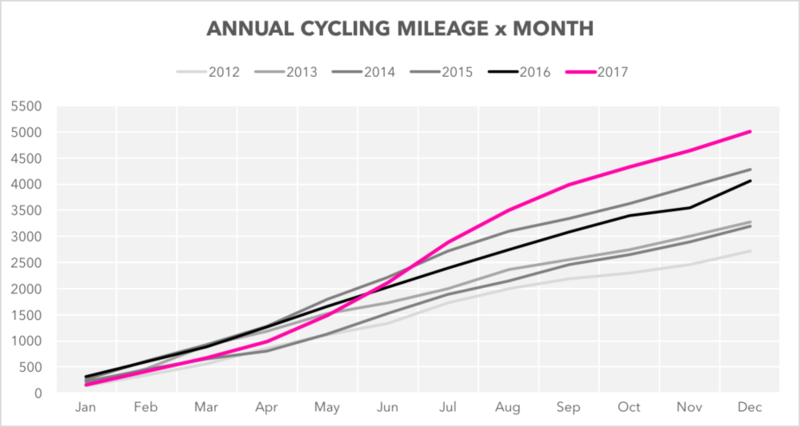 The chart on the left below is a monthly view of my miles for 2017 (pink line) versus past years while the chart on the right depicts how each month's mileage compares to past years and to the average each month. As the data show, I started slow in the first quarter of 2017 but picked it up mid-year, setting new monthly highs from June through October. I was able to rally and finish above my monthly average in November and December to help get me over the 5,000 mile mark.